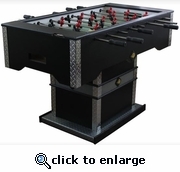 Foosball.com Best Foosball Table for 2017 - ManCaveModel - Crafted by Performance Games Inc.
w/ Top performing Fireball/PGI playing components, Handles, Playing Figures, Bumpers, Balls. Oil impregnate bushing for lower resistance. Counter-balance men with ultimate foot design. Playfield design includes: �� high-pressure laminated playfield and bottom cross supports Permanent attachment on all sides and under the goal wall Clear acrylic covering over the graphics and entire playfield to prevent scratches and damage.